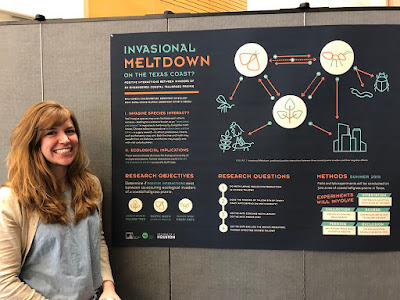 Emily Jones, grad student at University of Dayton, presented a poster on her field work plan for exotic species interactions in a Texas coastal prairie. 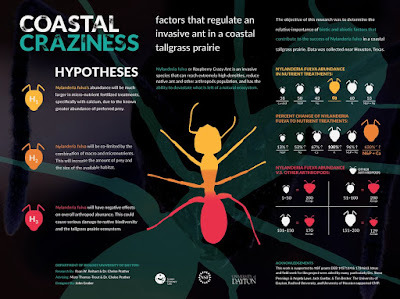 This got sent my way on the twittersphere (hat tip to Meghan Duffy) because it is a very nice looking poster. 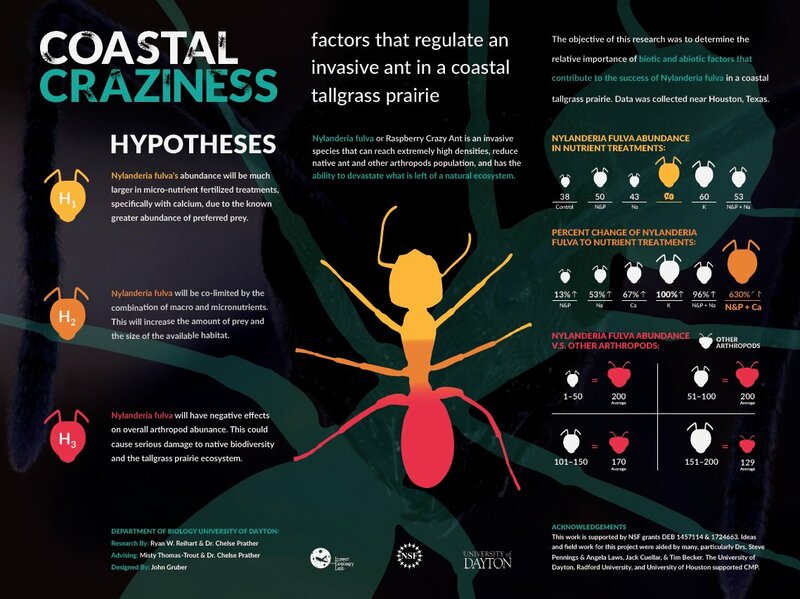 Her stunning poster was co-designed with an undergrad graphic artist as part of a class. How cool! But several people (including Andrea Kirkwood and Hannah Brazeau) mentioned that if the design is noteworthy enough to mention, maybe throw in the names of the students doing that design, too? The designers’ names are on the poster, up at the top under the title, which is great to see. I know from some people working with illustrators that the people making those graphics often significantly help bring clarity on the conceptual side, too. Good designers are often colleagues, and should be given that level of credit, not just down in the “Acknowledgements” fine print. Graphic design work is hard work. People seemed excited about the posters that we've made collaborating with a class of University of Daytone undergrad graphic designers (design faculty leading the course: Misty Thomas-Trout & Kathy Kargl) the past couple of years. ... The idea from this just arose from befriending a like-minded, awesome graphic designer (Misty Thomas-Trout). We have had a great time working with these design students that want to portray our science in a way that is more approachable to the general public an other scientists! As much as I love the posters presented in the thread, I hesitate to call it “science art.” Just like calling something “science” turns off a certain group of people who think they can’t do it, the tag “art” can do the same thing for scientists. They hear “art,” think of “fine art,” and go into the “I can’t draw” death spiral that leads them to not even try.